I'm playing around with the notion of this section being an area where I review random things such as technology, movies, books, restaurants...etc! It's a different kind of writing that I want to keep separate from my blog. Joe Satriani is a local guitar player whose been around since I was a young lad. He's always been an interesting and often masterful player. He's got the chops and can find the hook that will intrigue you. Instumental guitar can often be a bit of wankery and thus, it isn't something I always want to listen to unless it has that...special something. The song below is called Revelation and was performed live in Paris in 2008. It has that special secret sauce called Heart and Soul that I dare say, isn't always conveyed effectively or consistently in a lot of music these days, even in Joe's discography. He sure found it here IMO. While it simply shreds for over 6 minutes, it also manages to convey a kind of sweetness that begins with a sassy, swaggering smirk and ends with a big and beaming genuine smile. I imagine some character walking along some city street going about their day, chest and head closed up, and them listening to this a couple of times...Head and heart open up and relax, receive. Joe's heart roars and he smiles in this song. And perhaps, it is revelatory. I feel it's inspired playing with an emotive tonal range I find very affecting and that I think is more rare than not in the current age of pervasive wimp rock pop. Reminds me a bit of something Gary Moore was able to express in his epic live jams that were rich with emotionality. The audio is not optimal since I converted it from a video file as an audio recording doesn't appear to exist. My efforts at remastering audio and cleaning up some noise in the file this afternoon was unsuccessful. Apparently, this is not a skill that can be acquired in a couple of hours! 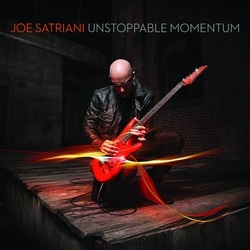 Additionally, Joe has a new album out...Unstoppable Momentum. I've been listening to it for a couple of weeks. It's a lot more relaxed and straighforward than much of his other work. There are some really appealing and interesting riffs that are well supported by a more musically muscular back up band than has been the case in his past efforts. Joe has always done his own thing, his own way. And those kind of people and efforts are something I always support.